Set in the picturesque foothills of the Dalaman mountains, a tranquil haven to relax and unwind, the most beautiful region along the turquoise Mediterranean coast. Our home is off the beaten track, totally private & not over looked, yet a short drive of only 5 minutes & you can be at the nearest restaurant. 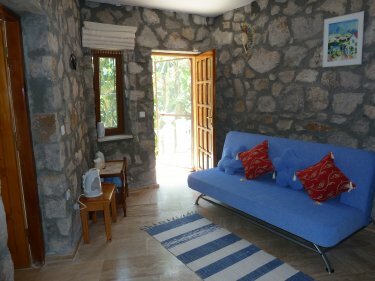 The main villa has an independent guest accommodation, with own separate access, attached to the main house. The accommodation is perfect for a couple or a small family. 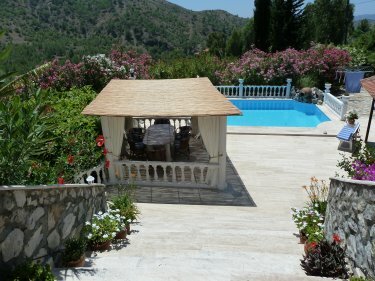 Time can be spent relaxing around the pool enjoying the long hot days in the sun on the padded sunloungers, or taking a drive to explore the unspoilt Turkish coastline. If you want to stretch your legs, there are many walks to enjoy the wonderful nature of the area & our guests are amazed to see many tortoises on their way. The area is truely amazing with beautiful scenic sandy beaches to visit, or take a leasurely stroll along the stunning Gocek marina or the bustling local towns of Dalaman, Fethiye and Dalyan. 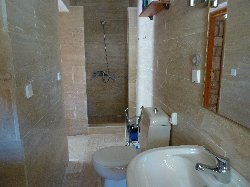 The accommodation consists of 2 good sized rooms and a bathroom. The first room is a double bedroom with an air-conditioning unit, bedside cabinets & free standing wardrobe. The second room can either be a lounge or 2nd bedroom as it contains a bed settee. In the lounge there is also a large ceiling fan, a free standing wardrobe, microwave & a coffee table with tea/coffee making facilities.There is a useful connecting door which connects the lounge to the bedroom, so this is ideal if you have youngsters. 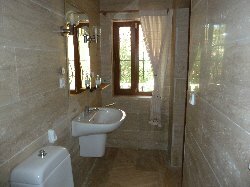 The Jack and Jill bathroom can be accessed from either room, it is fully tiled, has a shower, WC and washbasin. A hair dryer can be found in the bathroom. A large fridge is also provided for our guests to use, this is a few steps away by the bar, where your own cold drinks or fruit can be stored. We love the idea that we have one guest accommodation only for a holiday let, so any visitors to our villa can expect personal treatment & our full attention. Our guests have sole use of all the facilities which include: an 8m x 5m swimming pool, 4 comfortable sun loungers for relaxing, a covered bar area, a separate covered eating area containing a large marble table with 6 padded chairs, and a large stone barbecue allowing guests to cook & eat alfresco if they wish. 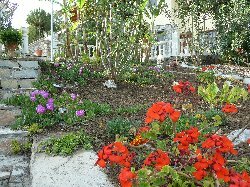 The garden & pool area is a riot of colour, full of flowers, palms & fruit trees. Spectacular views of the mountains add to the quiet, relaxing atmosphere of the property. Unfortunately the accommodation is not suitable for wheelchair users. There are several beaches to choose from and are about a 15 to 20 min drive away from the villa. Most of the beaches in this area are sand and quite safe for children. There are a few local restaurants nearby which offer a free pick up and return service. 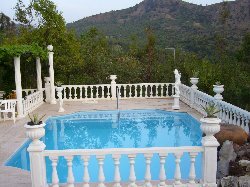 The nearest airport is Dalaman which is approx 20 min drive from the villa. 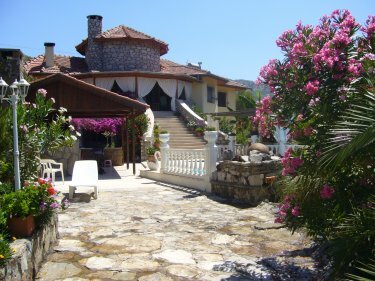 The villa is about 15 mins drive away from the town of Dalaman, but there are a few local shops and restaurants much closer. There are many, many interesting places to visit :Fethiye is an hour away:Gocek marina only 15 mins (if you are looking for up-market restaurants, cafes and quaint gift shops). Dalyan is 25 mins away. Here you can see the tombs or sail through the reed beds on one of the local water taxis to Iztuzu Beach (logger-head turtles breed here),or dine at restaurants by the river. Dalaman has a good selection of supermarkets, shops, banks and restaurants as well as some smaller local cafes to enable you to sample local Turkish cuisine. English/European dishes can also be found here, even a cooked english breakfast, however the Turkish menu is excellent and is typically a Mediterranean diet and very, very good. On Thursdays there is a large local market in Dalaman, selling clothes & shoes as well as locally grown produce. The riot of colour on the fruit & vegetable stalls will take your breath away as will the different tastes & smells that can be experienced. There is usually a market every day at one town or village close by, so if you miss Dalaman market you can always purchase good fresh produce on any day of the week. If you want a 'tourist' market for gifts, then Dalyan on a Saturday is not to be missed. Excitement can also be found around & if you want to experience something less sedate you could try horse riding, white water rafting, jeep safari, mud baths, quad biking, or one of the many boat trips. Car hire is essential as there is no public transport available. We can arrange a hire car for you on request, at a competitive rate, which includes a free transfer service from the airport direct to the villa. There is a small charge for transfer during the hours of 22.00 - 07.00. Please enquire at time of booking. On receipt of an enquiry a booking form will be sent to you, either by email or by post, with all the details of the booking process. At the time of booking a 20% deposit is required, the balance is due 8 weeks before your holiday. Changeover days are flexible as are arrival and departure times. 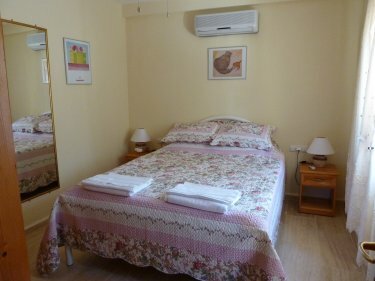 The cost is �50 for the accommodation per night, sleeping 2 adults. Extra adults or over 14's - an additional �25 each per night. Children under 14 - an additional �20 each per night. Under 2 years free. There is no extra charge for the air-con. Breakfast is usually a Turkish breakfast which consists of fruit juices, fresh bread, cheeses, tomato, cucumber, olives, jams, marmalade (homemade) and eggs done to your liking. Seasonal fresh fruit & tea or coffee. Breakfast can be flexible, please ask. Further meals can be provided on request.